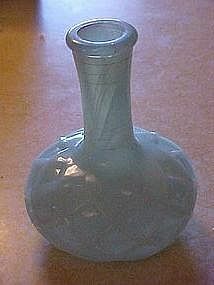 I think this was a cologne bottle with the top missing. Makes a nice vase though. However it is a nice piece of vintage Jadite. Upon close inspection is really more opalescent and has a akro agate swirl in the glass. Measures 5" tall, no chips or cracks.